What is a Driver Helpful DOT Physical? Helping drivers and motor carriers is what we do. Drivers with certain medical conditions need a medical examiner who not only knows the medical requirements, but who is interested in helping the driver maintain their livelihood. At the same time, our driving certifications provide the safety aspects that motor carriers require. Pass Your DOT Medical Exam! Dr. Rudé knows how important it is that you continue your livelihood as a commercial driver. With his extensive knowledge of the DOT Physical Exam medical guidelines, Dr. Rudé will steer you through the DOT Physical Exam requirements so you can Keep on Truckin’. 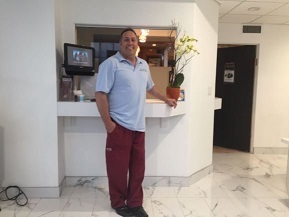 Looking for a DOT Physical Exam or CDL Physical Exam in Los Angeles!, California? You’ve come to the right place! Our Clinic is located on the ground floor, at the corner of David Ave. and Robertson blvd., just a quarter mile north off the 10 freeway. From Pico and Robertson blvd. intersection head south a half mile on Robertson until main cross street Cadillac Ave, our clinic is one block south of Cadillac Ave.
Dr. Dan is a National Registry Certified Medical Examiner performing medical exams for drivers of commercial vehicles. He is a graduate of the Premier Chiropractic Educational Institution in World, Graduate Palmer College of Chiropractic, where specific education is given in the correction of spinal misalignment. In practice for 20 years, 16 of those years in the same location. His office providing caring service for drivers and patients, with advanced training through the American Council on Exercise. He is Past President of the California Chiropractic Association Los Angeles Metropolitan District.